Don’t let anything spoil the perfect picture! With the dedicated PhotoFix and Makeover studios you can remove common imperfections and improve your favourite photos in a couple of clicks...it’s incredibly easy to get a professional finish. Remove red eye, spots and blemishes from your stunning wedding, birthday and holiday pictures, smooth skin appearance and use simple resizing tools to trim down and enlarge pictures to fit a frame or canvas in one click. And don’t worry, you can easily return to your original image at any point no matter how much you edit. You don’t need to be a professional photographer to enjoy the high-end features in PhotoPlus X7. Enjoy the new Lab Colour Mode; a powerful and professional colour mode which ensures skin tones, backgrounds and objects look far more natural, while allowing you to edit colours quickly and easily. Shoot and edit Raw images from most DSLR cameras and create memorable scenic photos with High Dynamic Range image merging, which combines different exposures from multiple photos and merges them into one image for a stunning, layered effect. With PhotoPlus X7 you have access to an amazing collection of creative effects, perfect for impressing family and friends. Add stunning colour and filter effects, give your photos a classic look in a black & white Studio, add half tone effects and use one-click presets to give your photos a retro or vintage feel. Create breathtaking imagery by adding multiple effect layers onto the same image. Why not have fun with your photos using the crazy Warp Studio and add fully customisable artistic filter effects with the Filter Gallery. Unlock your creativity with PhotoPlus X7, it’s easy! Don’t let classic photos become a thing of the past! Eliminate scratches, unwanted marks and creases in one click, and remove blemishes, spots and red eye with PhotoFix. You can perfect your photos with simple tools for removing objects and changing backgrounds to ensure you get the ideal image. Use the improved Clone Tool to copy a section of an image and brush over marks, creases and tears in your picture with pinpoint precision. You can even see a live preview of your progress as you restore your photos. 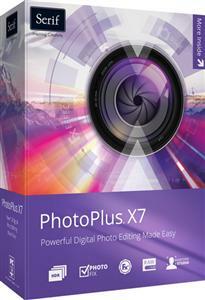 PhotoPlus X7 ensures editing is fast and smooth, with all the help you’ll need to create stunning photography. Get started instantly with the new StartUp Assistant, where you can access your latest projects, read Serif news and learn the latest photo editing techniques with regularly updated tutorials, hints and tips. Edit photos in an intuitive workspace and enjoy amazing speed and efficiency as you edit with support for 64-bit computers. PhotoPlus X7 enables you to edit photos quickly, with help every step of the way. Don’t keep your beautifully edited creations to yourself, share them with the world! Choose a selection of your favourite photos and upload them to Facebook and Flickr in a flash. You can also email or print your pictures to share with family and friends around the world with just one click. An integrated image optimiser ensures you get the highest-quality however you choose to export your photos.